Unloading from the speed ferry. Note that you'll have to walk through the water, so wear shorts & sandles! Gili T was truly reminiscent of Cabo, which was ironic because it was the only truly Muslim area we stayed in. Indonesia as a country is Muslim, but the island of Bali identifies as mainly Hindu. Even more interesting, we were there during Ramadan. This was only apparent when we were woken up in the middle of the night to the tolling of the neighborhood mosque bells for 2 am prayer. Love experiencing different cultures, don't love being woken up in the middle of the night. The roads in Gili T are more like cobblestone footpaths. Wheeled suitcases do not fare well here. To get to Gili T, we were picked up from our hotel in Amed and transported to the port. We boarded our “speedboat” with about 30 others and began the hour long ride to the Gili Islands. These are three tiny landmasses off the coast of Lombak, another Indonesian island. 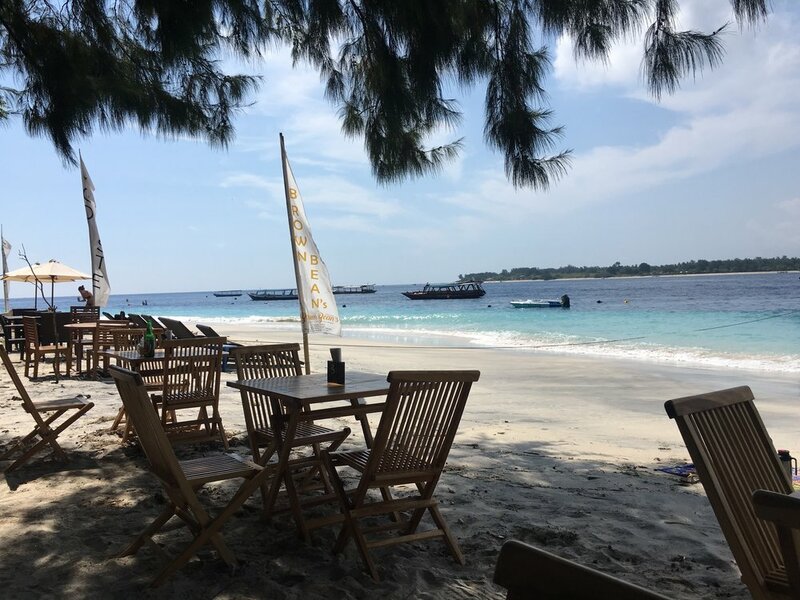 Gili T is the biggest and most popular for its party vibes, so was a natural choice for us. We spent the day drinking world’s yummiest rum punch at a literally on-the-beach restaurant called Brown Bean’s. There are a lot of restaurants like this on the island, where all you have to do is buy a drink to gain access to a sun chair right at the edge of the ocean. We got mildly tipsy (for Bali) after maybe 5-6 punches in a row. They were really yummy and relatively inexpensive (for Bali). We wandered the beach and considered doing magic mushrooms (which are available here), but thought... better not. The oceanside setup most restaurants on Gili T are rocking. Kev and I sipping Brown Bean's rum punch on the beach. One highlight of the day: We found a beer pong-themed bar that had a running challenge...chug a Bintang beer and put a point on the board for your country. Chug three in under a minute and get five points for your country. Kevin tried to go for five and almost threw up, but over the course of 24 hours managed to put up a few points for America. We later came back and played BP against some British guys and lost so, not our best day repping the USA. Balinese bar owners leveraging game mechanics to get drunk foreigners to drink more. This kid might not look like much, but he was inspiring Kev to the point of tears with his violin skills. We had dinner at the famed Scallywag’s, which is a BBQ and buffet joint, again on the water. Nice ambiance and experience, but maybe not exactly worth the money. Walking back to our room, there was all kinds of partying going on around us very reminiscent of spring break in college. We tried to be into it, but it turns out we’re too old to do shots if our friends aren't buying them for us. Oh well! The next morning, we were served breakfast on our terrace. Eggs and toast and fruit and banana pancakes, complete with fresh juice and real french pressed coffee (one of the first times we didn't find coffee ground sludge in the bottom of the cup). We did a little shopping around in the morning, as the little island has a ton of cute, affordable boutiques. Then, it was back on the boat for our hour and a half trip back to the mainland - this time, to the tiny town of Padang Bai. Lining up to get back on our speed ferry -- this time, to Padang Bai!